Letscabo-Inc. at Casa del Mar Golf Beach & Spa Resort. This 1 bedroom that can double in size to a 2 bedrooms 2 baths when the equal in size & amenities attached unit is added. Contact me for more details and adding the attached unit, or if the unit is not showing as available as the reservation availability calendar does not cover the equal sized attached unit. Honeymoon, romantic getaway, or just a family vacation, Casa Del Mar Golf Resort & Spa offers five-star luxury accommodations with world-class amenities. Beach front resort, facing a 3 miles long sandy beach, surrounded by lush gardens, six swimming pools. Our unique to Cabo 40 acre resort, is a shared combination of a beautiful boutique hotel "Casa del Mar Golf & Spa Resort", and luxury 1 & 2 bedroom condominiums that meet the needs of most demanding vacationers. We are very kids friendly, yet the large and spacious grounds provide the privacy & serenity when you seek it. Signature golf course, enjoy the magnificent views of the Sea of Cortez while being delighted by the spa pleasures. Fall in love with the casual sophistication, Mexican warmth and hospitality that only our dedicated personnel can offer. Soak up the sun in one of six swimming pools carefully integrated into the landscape, designed to harmonize with the natural beauty of Baja California. The two large pools also have large Jacuzzis and a swim-up bar. 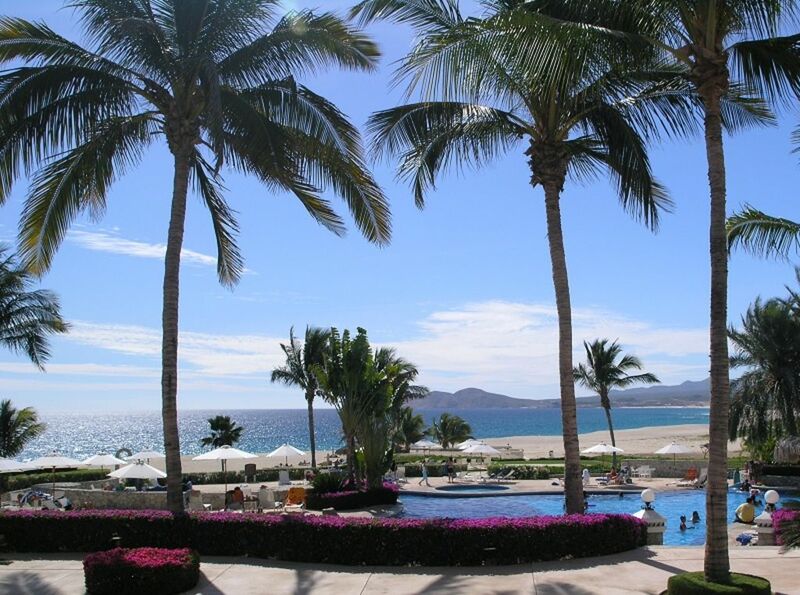 Or, enjoy the view of the Sea of Cortez under the shade of a pool-side palapa overlooking the beach. For those seeking to lose themselves in the surrounding beauty without being disturbed, we provide quite zones with heart warming views. Casa del Mar features a sophisticated European-style spa. Our spa offers a variety of health, beauty, and body treatments for the mind and the soul. To put the finishing touches on the rejuvenated you, we feature a world-class Spa & beauty salon, which offers a variety of services including manicures, pedicures, and facials. In a resort with a mind towards pampering the active guests; Breakfast, lunch and dinner are available at our restaurant or pool side cafe For golfers and other early risers, our restaurant opens for service at 6:30 AM daily. In traditional Mexican fashion, guests are encouraged to dine at their leisure either in air-conditioned comfort or on the covered terrace surrounded by tropical gardens, waterfalls, and coconut palms while listening to the relaxing sound of the surf in the background. Dinner at Casa del Mar is a romantic experience. Our versatile restaurant is equally suited for romance or an important business discussion with service attuned to the special needs of the individual guests. The state-of-the-art kitchen can handle your every need. Look no further, Casa del Mar is the essence of the search of many for a highly pleasurable and uniquely memorable stay in Los Cabos. LetsCabo at Casa del Mar. These units are finished internally and externally in Hacienda-style architecture with beautiful, all marble bathrooms. Free Wireless Internet in the units we offer. Please note that there is a daily access fee to use the spa and restaurants paid to the boutique Hotel within our complex. All pools, the beach / beach chairs, all the grounds in in our complex of both the condos, and hotel, plus the parking and tennis courts are already included with your rent. This NOT an ALL-INCLUSIVE resort complex. Chauffeur/Limo Service, Spa, Restaurants, Cafe and Bar are pay as you go and are NOT included with the rental. This NOT an all-inclusive stay. This Resort has 5 blocks of sandy beach. We have 6 Pools (2 large, 4 smaller and less used), The unit has a full kitchen with a large refrigerator, Free Parking, "NO SMOKING"
They enjoyed our stay. The unit had a great location in this lovely resort. Pool was right off the ground floor patio of this apartment. Located half between Cabo San Lucas and San Jose del Cabo made it easy to great to both communities to have a look around. Weather was amazing. We really enjoyed our stay in this spacious unit at Casa del Mar. Everything inside was just as shown. The bedroom has a very comfortable king bed and a spacious bathroom. The ground floor patio with ocean view opening onto the pool deck is extremely nice (compared to a 2nd or 3rd floor unit), and the grounds are immaculate. We also enjoyed the main pool in front of the hotel. We also appreciated having a washer and drier, as we did not have to bring that much laundry. Unless you are planning to stay put, I recommend renting a car if you are planning to stay here. Absolutely wonderful accommodations, views are superb, landscaping impeccable, such beauty all around. Convenient access and easy checkout. Beautiful, quiet property! Lovely unit and owners! The condo was slightly dated (and the bed a little hard for our taste), but don’t let any of that dissuade you from selecting this spot. The grounds were covered with wonderful flowers and plants and immaculate. The pools and hot tubs were clean and warm. The ocean beach was 200 yards from our door and readily accessible. The maid was great, food at the breakfast buffet pretty good. Overall I’d say a 9 out of 10. I would not hesitate to stay here again and would recommend it highly if you want beauty, peace, quiet and value. Great resort, everyone really nice. The resort is perfect, great staff, the grounds manicured beautifully, highly recommend. 1) NO PETS ALLOWED. 2) Maximum occupancy in 1 bedroom is 4 persons of any age, in 2 Bedrooms 2 Baths is 6. 3) Pools open 8:00 am to 8:00 pm 4) 50% cancellation fee of rental amount after the reservation is booked, and 100% of the amount within 30 days. Guest can reschedule within 1 year of the reservation date to another equal or lower rate stay plus any price difference.